Who Cares About The Ryder Cup? Yes, yes, I know it’s a big week for golf with the Ryder Cup picks and all. Mind you, it was an easy task for Jim Furyk to choose Bryson DeChambeau, Tiger and Phil (and undoubtedly Tony Finau on Monday next). I imagine, however, that Thomas Bjorn’s job was a little more testing – but who on earth could have predicted he’d put his faith in Sergio who hasn’t shown any real form since his Masters victory last year? In fact, Garcia has missed the cut in the last five majors but let’s not dwell on that. Henrik Stenson and Paul Casey showed decent form at the start of the year but both have been quiet of late. Oh well, at least the European Tour won’t have to worry about a knock on the door from Casey demanding a refund of his membership subs! If you detect a momentary lack of interest on my part it’s because in this normally golf-mad household it’s been all about cycling, cycling, cycling. 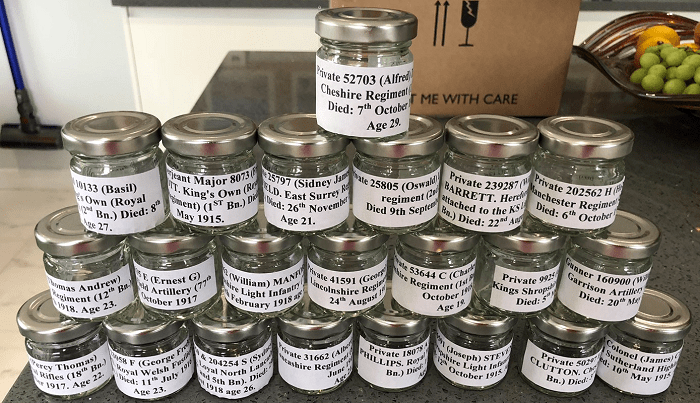 Today is the big day – eight intrepid riders start their five-day 320-mile odyssey visiting 22 First World War graves in Belgium and France…….and hubby Brian has made it! Less than eight weeks ago he was under the knife having elbow surgery, simultaneously nursing a broken collar bone, a broken rib (he just shared that little nugget with me two days ago) and a twisted pelvis. He had lost an argument with a pot hole while out on a training ride and from that moment on his entire raison d’etre was to disappoint the reserve rider. Move over Bryson DeChambeau in the focused stakes! We are two villages straddling the Welsh/English border, conveniently linked by the wonderful Queen’s Head pub and there are a total of 22 names on the two village war memorials. The group of riders and their support staff will visit all 22 graves, sprinkling soil from the respective villages at each site as a sign of respect and planting a small wooden cross bearing the relevant name. 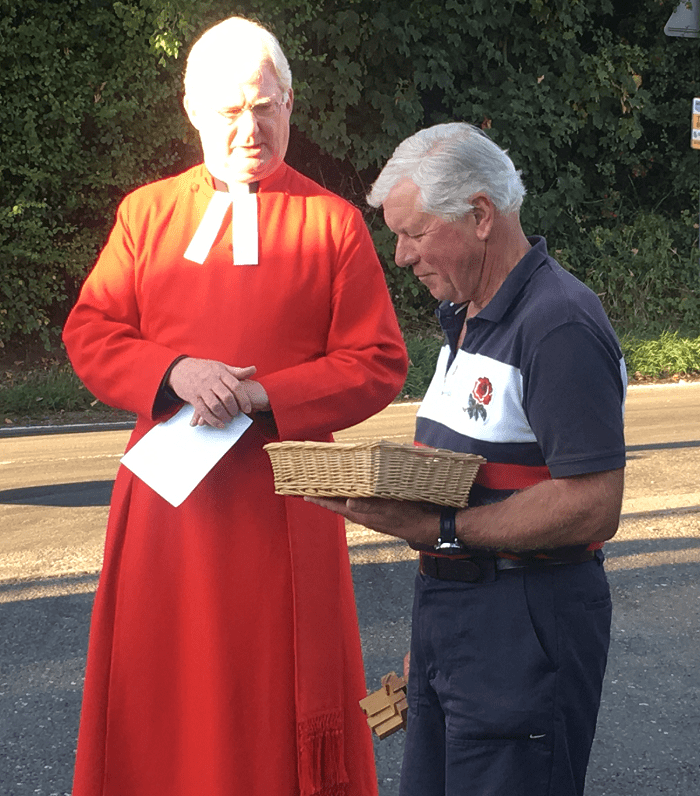 The other evening our rector, Ian Davenport, conducted a blessing of the soil as we all gathered in the pub car park to oversee the loading of the vans with bikes and bags ahead of a 5 a.m. start yesterday morning. 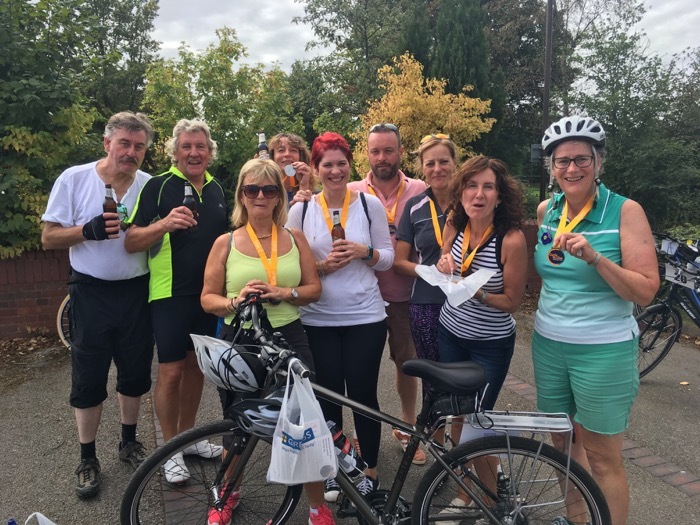 The fundraising is north of £7500 so far and everything raised is going to support SSAFA, the Armed Forces charity – it’s a real community effort. Reverend Canon Ian Davenport, Rector, Rural Dean and Chaplain to HM The Queen, conducted the blessing. Here with David Paton, local historian and key member of the support group. Obviously, I’m used to packing for golf sporting events so it was interesting for me to see Brian’s packing laid out on the bed. Now, I thought that there wasn’t really an awful lot to cycling gear – skimpy lycra shorts and tops, a helmet, gloves, shoes and away you go! Erm, not quite. An array of energy bars and electrolytes were reverentially laid out alongside Dr Beckmann’s non-bio travel wash (other brands are available) and a mysterious-looking something or other claiming to be chamois butter. Don’t ask. Next were a couple of pairs of what Brian pleases to call his armoured pants – an absolute must for someone who a few years ago managed to smash his femur to smithereens in the first of what he calls his “unlucky accidents”. These are not the slim, skimpy cycling shorts of his mates. These beasts have migrated from the world of mountain biking and are bulky, industrial-sized passion killers. Next to them were two armoured elbow protectors and oodles of layers to help cope with temperatures ranging from early morning chills to the heat of the afternoon. It’s all a far cry from the packing that will be required by Messrs McIlroy and co on THEIR little jaunt to France. Just Brian’s bike remaining to be packed into the van. The team’s request for him to have stabilisers fitted was spurned! And here I am this morning with fingers crossed that they all cycle safely, achieve their goals and come back in one piece. 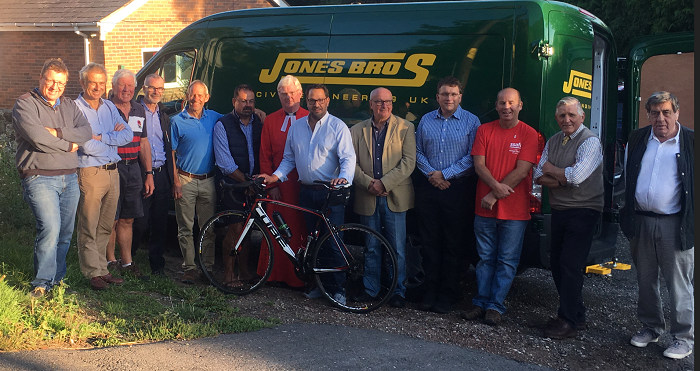 The immense sacrifice of our 22 local lads merits the efforts of these 8 mamils (middle-aged men in lycra) and their support crew. It puts just about everything in perspective, certainly all sporting events. And yes, even the Ryder Cup. In due course you’ll find that there’s a bit of a cycling theme to this week’s blog, even though the Ryder Cup captains have been making their picks – and some uncomfortable phone calls. I texted a friend who’s recovering from a double hip operation – never a woman to do anything by halves – and said I didn’t think I’d have picked Phil but she was quite happy because she thinks he’ll be useless. Never a woman to be short of an opinion. My fear is that the sainted Sergio and Henrik will be just as useless but I’m not going to criticise Thomas Bjorn or Jim Furyk yet. The clue is in the name: captain’s picks. Not mine, not yours, his. And next year, when the Solheim Cup at Gleneagles rolls round, it’ll be hers. As a captain, all I’d be wanting is for all 12 of my players to be playing well and putting the lights out on the days of the competition. That would do me. If we weren’t hoisting the trophy at the end, I’d be playing the gracious loser and coming to terms with the dubious but enduring honour of being part of one of the greatest matches of all time, to be replayed for ever and a day during rain delays; a lifetime of wondering if something had got lost in translation: putting the lights out means holing every putt, it is not a Sun-like reference to the possibility of Neil Kinnock becoming prime minister. Older readers (is there any other sort!) may remember the pre-election headline: Last Out Switch Off The Lights – or some such brilliantly effective scaremongering crack. Anyway, as an old friend is fond of saying, golf is played on grass and not on paper, so I’m not panicking yet at our (that’s Europe) relative inexperience and maybe Sergio will come to Paris revived, refreshed and winning points. I’m not too worried about the in-form DeChambeau because he’ll probably take so long over his pre-shot calculations and his post-shot post mortems that he’ll be lapped and be lucky to complete a match. I admit I think he’s terrific but he’d drive you batty. The other day he hit a shot that didn’t work out as planned (meticulously) and the look of astonishment and incomprehension on his face was comical. Then, still standing stock still with shock, he whipped out his charts and went through the old “recalculating, recalculating” schtick. In your own time, Bryson. 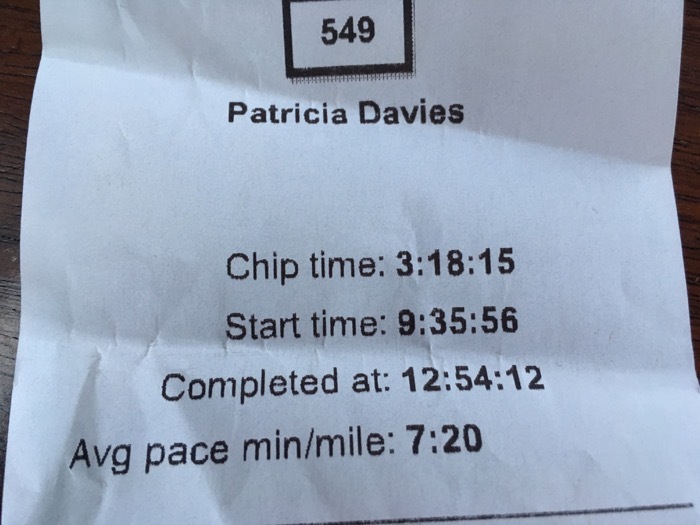 Actually, that brought to mind my time last Sunday, when I completed the St Giles Bike Ride in a very undistinguished 3 hours 18 minutes 15 seconds. That equated to 7 minutes 20 seconds a mile. Blimey, I thought, I could nearly have walked it that fast. You could choose to do the 75-mile route, the 40-miler or, as I did, the 26-mile stroll. Apparently, one intrepid soul (or show-off who should have been in the Tour of Britain or Espana) did all three. I didn’t dare ask for his (or her) time. Anyway, we had two official pit stops and one unofficial – at the Green Man in Clifton Campville, which was just opening up as we puffed by. Being the team from the world-renowned Horse and Jockey in Sandford Street in Lichfield (it’s my local, so they took pity on me and roped me in), we had to stop and exchange fraternal greetings and aid the survival of a village hostelry that dates from the 18th century. It’s the taking part that counts, not the time. Isn’t that right, Bryson? St Giles Hospice in Whittington was where Dai was cared for in the days before he died, so it’s a cause dear to my heart and it costs about £9 million a year to keep it up and running. Actually, I did about 32 miles because I cycled to the start and then, much more painfully, even thought most of it is downhill, back home. Cyclists wear those padded shorts for a very good reason and after my marathon I read about a woman who’d worn three pairs (at once) so that she could cope with London to Paris. 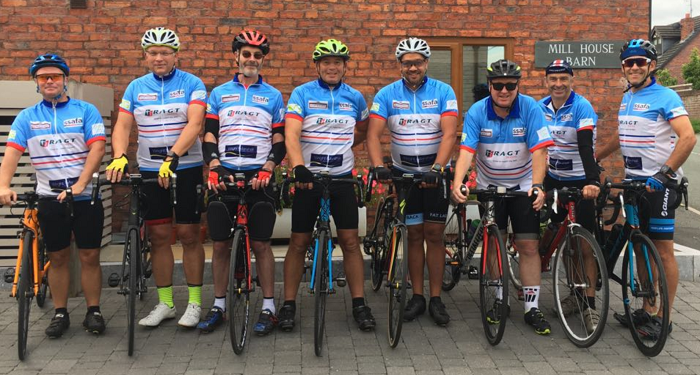 Good luck to Brian and his SSAFA boys (see Maureen’s post). My admiration knows no bounds – literally. 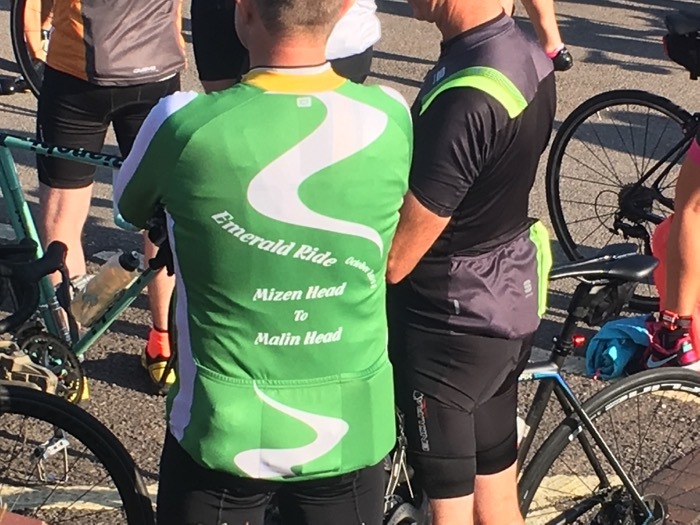 Some serious shirts at the start of the St Giles ride. Not sure I’m ready for the length of Ireland yet. 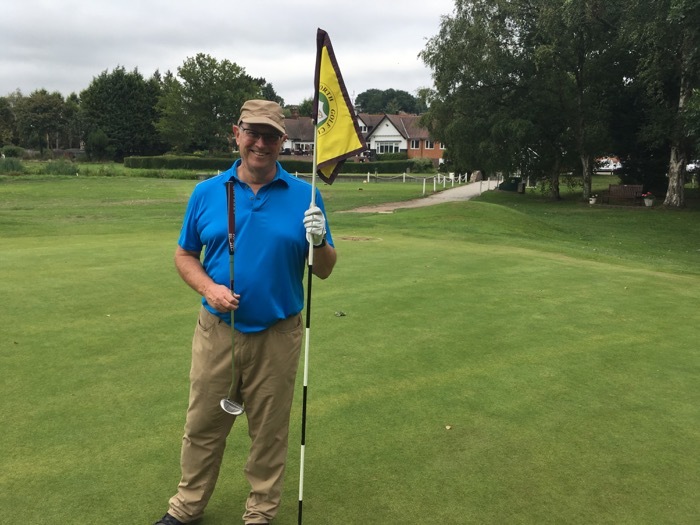 Now, I’m not one to boast – not least because as my friends and family point out I have very little to boast about – but the morning after my cycling exertions I went to the gym, then played golf with my brother-in-law at Handsworth. Paul, Dai’s brother, plays off 26 (or he did but I’m hoping the match and handicap chair will hear of this), so I graciously gave him some shots and, apart from the 1st, not knowing how they are with such things at Handsworth, I played from the same tees. At the 1st, playing from the reds, I hit two remarkably decent shots and holed a curly old putt of about 35 feet for a birdie three. My opponent had a triple bogey seven, as befits a 26-handicapper. Brother-in-law Paul trying his best not to look too smug after his 5 and 4 triumph! Culrath, the house I was in at school, had the motto: “Modest in victory, cheerful in defeat” and we mostly had to be cheerful. Let’s hope that after the Ryder Cup in Paris later this month, Thomas Bjorn, Europe’s captain, can be a grumpy, grouchy, gold-trophy-wielding Dane.